I want to use 2D background images in MikuMikuDance. How do I use a photograph as a background image for my MMD pictures? Will a simple photo work as a background image? Use 2D Background Images to make pictures and videos in MikuMikuDance! Today I will show you how to use background images to your advantage! First, select one of your own photos or browse DeviantArt or another website with good stock photos and find one you can use. (Remember to credit the person or group who makes the stock photos). Here I’m using a fence scene, taken from Moon_WillowStock on Deviant Art. I’ve edited it a tad bit ahead of time in GIMP, but this method will work well with an unedited photo, as well. Try to adjust you screen size as close as you can to the pictures dimensions. By going to View> Screen Size. Move the coordinate axis down so that it is pretty level with the ground in you picture. Do this by adjusting the camera angle. 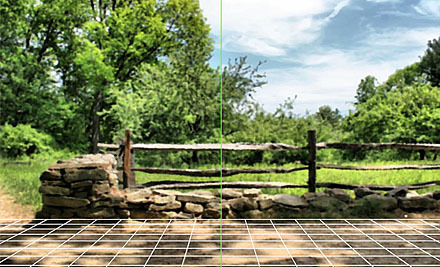 Move around with your camera a bit and lower the view angle to about 25, so it matches up with the ground accurately. 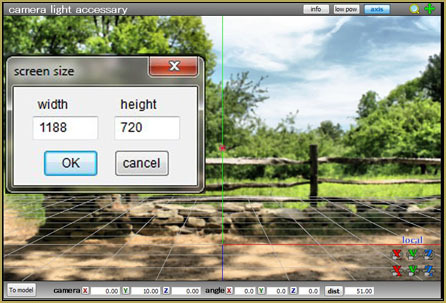 Load your model, pose her (or him) up, and move the camera around the 3D space to a position that makes sense. When working with a 2D background the camera will offer more help positioning a model than the model itself. HINT: Getting rid of the axis might help you with this step. Now, remember to register your camera. Then, add a diffusion effect. If you can’t get Diffusion 7 on your computer because of your graphics card, you can use Diffusion 6 which worked on my old computer just as well as Diffusion 7. If you want to leave the picture like that, that’s okay. If you don’t, crop it and sharpen it in GIMP or Photoshop. I was wondering if it is possible to use multiple pictures, like in frame 0 you would have a picture of a park, and in frame 100 you would switch to a picture of a house, and in frame 200 you would switch to a picture of a mountain in the background. Is this possible or are we stuck to just 1 picture? Using multiple pictures is not possible as such. You might use some workarounds, though. One option is to create several copies of the same video, each with its own background picture, then cut them to pieces and assemble as you like using Avidemux (or any other video editing software you’re comfortable with). Another is to create a background *video* consisting of those static frames. Perhaps it might be possible to use some MME effect to imitate backgrounds as well, but those experiments I did so far were not satisfactory (then again, having those two other options at hand, I wasn’t *very* insistent). MMD is very picky about the type of video it accepts. 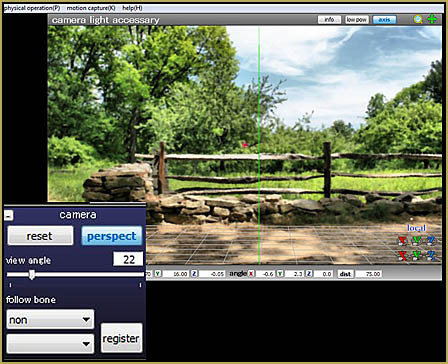 You can use Format Factory free software to recode the video into “AVI type 1”. How do you add pictures as a background in MMD? Specifically meaning what are the steps to put a 2-D picture in MMD? Hi. I have used MMD for a couple of days now and whenever I try to load a stage or background there’s always a weird grey platform/floor that won’t go away! I’ve been trying to look on the internet, but it was to no avail. I have the latest version of MMD and have little or no issues on my computer. Thank you! I believe that’s an easy one … Under the VIEW menu you want to uncheck Display Coordinate Axis(G). All good, yes? 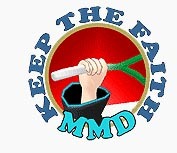 Have you seen our “Start Here” page for step-by=step MMD instructions? It might help you enjoy MMD. Please ask questions!